Hello crafters! I have another silhouette project for you today. I have to say that I am really enjoying my new Cameo. I just love it! I found this really cool treat box (or bag) in the silhouette store. The one thing I love about the Cameo is that all of the score lines are done for you without it looking too obvious. 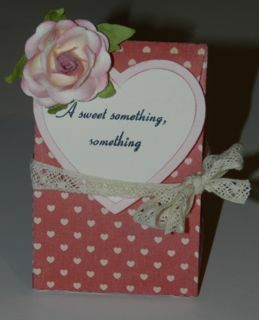 I used the latest K&Company Valentine's Day paper pack for my box. To keep the box closed, I added some velcro. In a project that will go live on Wednesday, I had some left over hearts nd incorporated them into this project. Using the Pink By Design Flirty Girl stamp set, I added my sentiment in two steps. I used some Recollection paper roses and finished the box off with some victorian lace ribbon from Stampin' Up! P.S. I am one away from reaching 200 followers. I am planning a really good giveaway when there is a 200th follower. This treat box is so beautiful!